Edmonds Cookbook a classic New Zealand cookbook. Full of new and old family favourite recipes from nearly 110 years of history. A must have in your recipe collection. This is the 69th Edition. 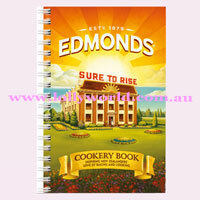 Edmonds Cookbook is a classic New Zealand cookbook. Full of new and old family favourite recipes from nearly 110 years of history. A must have in your recipe collection. This is the 69th Edition.